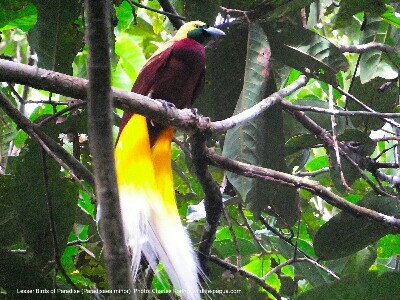 The Lesser Birds of Paradise (Paradisaea minor) is one of the most important targets among birding visitors who come to West Papua. This bird species lives in lowland to lower montane forest of New Guinea. In the forest, male and female birds like to gather in certain trees where males compete one anothwr to attract their female counterpart. There are several sites in Arfak mountains, Tambrauw Mountains and Klabolo forest and Ridge forest of Sorong regency that have become destination for watching the paradise birds. Usually, visitors watch the paradise birds in the mornings (from 06.00 to 09.00) and in the afternoons (from 15.00 to 17.00). Male Lesser Birds of Paradise perform courtship dance to show their beautiful feather and dancing skills to their female counterparts. If the female birds are impressed with the performance, they will mate the winner of the dance competition. Male Lesser Birds of Paradise can have more than one mating partners. Paradise birds, together with other birds, eat fruits and spread their seeds to all corners of the forest. Their functions as seed dispersers are important in maintaining and growing forest. 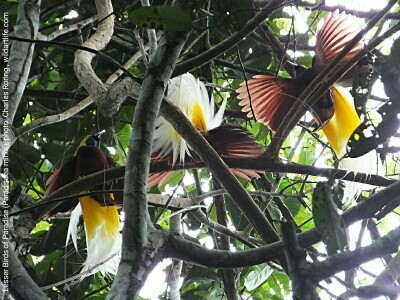 To watch paradise birds in tropical rainforest of West Papua, visitors often need to wake up early in the morning at 04.00. After drinking tea or coffee and made some preparation, they will be escorted by local guides to the lek of the paradise birds. A good pair of binoculars and a spotting scope will enhance the birding experience. Swarovski, Nikon, Leica, Zeiss, Vortex and Kowa are some of the manufacturers that make high quality birdwatching and wildlife watching devices. I personally use some Chinese made binoculars such as the 10x42 mm Visionking. They are excellent budget friendly birding devices. For me, the Visionking is the most affordable device that produces good bird images. Most people who watch the Paradise Birds want to take pictures of them. A good D-SLR camera equipped with 600 mm telephoto lens will provide significant reach for anybody who wants to take pictures of the birds. However, the price of a D-SLR camera with its telephoto lens is very expensive. It is also heavy to carry. A cheaper solution is by buying a powerful bridge camera that can take good quality photographs of birds with a reasonable price. I use Fujifilm HS50EXR. For birding in New Guinea and its surrounding islands, visitors are highly recommended to buy field guide book: Birds of New Guinea written by Thane K. Pratt and Bruce Beehler.